It's also Memorial day. Memorial Day is set aside to remember those who have died defending our country and remembering those we love who have passed. Please keep them in your thoughts. 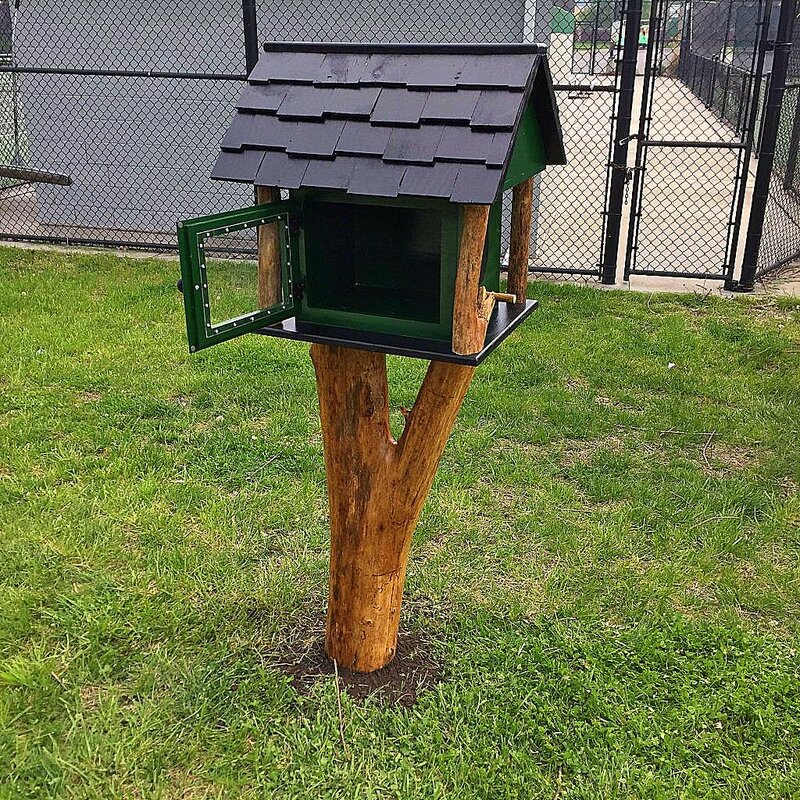 I think I've mentioned Little Free Libraries before. I shared a picture of a cool one earlier this year. The Wife's students decided to make one and install it along a bike/walk trail behind the school. 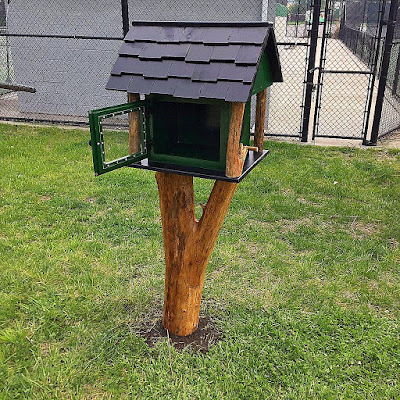 The Little Free Library was formally installed on the 7 May. It was very nicely done as you can see in the picture. The Little Free Library before the act of stupidity. Sadly this little contribution to society, a gift to the community, a bright spot, could not survive the swinging of a bat. Three weeks after its christening, someone apparently did not appreciate the freely given gift of literacy and destroyed the Little Free Library. It doesn't really make sense. Did this free gift offend you in any way? Did the satisfaction you felt in its destruction surpass the good it would provide the community? Did it remind you of you own illiteracy? Or are you just petty and selfish? When I see senseless destruction like this, and I see too much of it, I wonder if the Trump candidacy is exactly what we deserve. Maybe Trump is all that bad karma coming back to punish us for letting all this stupid go unchecked. Book: Terry Pratchett And Stephen Baxter's "The Long Earth"
I checked this ebook out from the library since Terry Pratchett has a pretty good reputation and I was interested in starting a new series. The book, "The Long Earth", is about parallel Earths and what happens when the world learns how to "step" from one copy to the next. Unlike most parallel world stories that often involve meeting alternate versions of ourselves and strange variations of our society where the Nazis won World War II or something like that, the alternate earths in this book are all uninhabited by advanced life. All these empty worlds offer humanity an unending frontier to explore and colonize. We follow a natural stepper, someone who doesn't need the stepper box to move from Earth to Earth. Joining with a sentient machine they travel along the Long Earth exploring the multiple variations. They eventually find hints of a potential threat to humanity coming and they go to find out what it is. It is the conclusion of the book that was disappointing to me. They find the threat and, frankly, it's quite ho hum. It is a relatively interesting and unique threat but it is also hard to call it a threat too. There are currently four books in the series and I hope things will develop in a more interesting direction. The first book of a series can sometimes feel incomplete and that might be the case for this series. I gave this book three stars on Goodreads. Hopefully the starts will increase with the next book. I saw this picture the other day while I was walking. While I have a ringing in my left ear I'm not deaf and both of my eyes are blue. But it's still an OK likeness. We spent this weekend in Minneapolis to celebrate the GodSon's Ed. S. graduation and to visit with family. It had been a while since I went anywhere really. The Wife has visited her parents at their home in Marshalltown and at their lake house a few times but I have stayed home with Iago. This short two night car trip felt awesome to me. 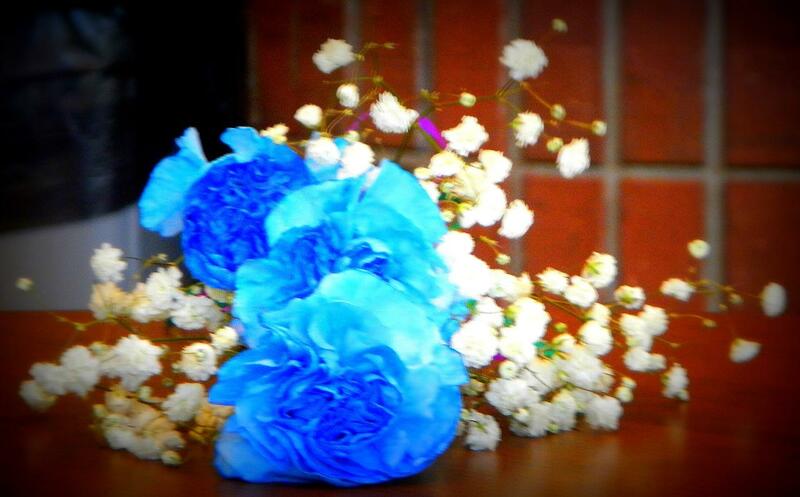 The blue carnations give to the Ed S. graduates during the hooding ceremony. Saturday morning was filled up with the hooding ceremony and the graduation. After the festivities the Matron of Honor (MoH) and Best Man (BM) took us out to lunch. The place they took us offered bacon flights i.e. sample size servings of bacon and various dipping sauces. What's not to like about bacon and sauces? A brilliant idea. After lunch, and a ten minute nap at the MoH and BM's house, everyone started to show up. This included the GodSon's and the Altar Boy's families. In total eight adults and seven extremely well behaved children. The day was rounded out with an afternoon of politics and bathroom talk punctuated by pizza and watermelon. I do like our heated but friendly discussions when we get together. Five years ago today I put on my pack and left Saint Jean Pied de Port starting my first Camino. I didn't know it then but it would be the start of a life changing adventure. For the next forty days I would meet so many amazing people, hear so many amazing stories, see so many amazing vistas, and experience so much life. 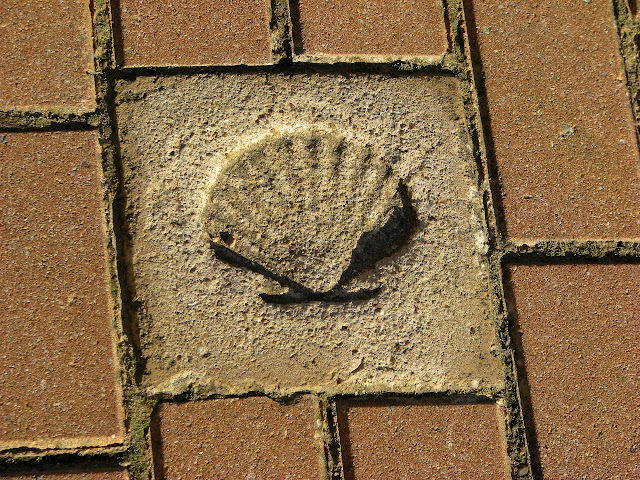 The Camino entered me through the soles of my feet and never let me go. A guide along the way. My outlook on life changed and my need to experience life started on that day five years ago. The Camino drove me to return for a second time, to ride RAGBRAI, and started me on the path to the Appalachian Trail. The Camino brought me to life. I can not express how grateful I am. After seeing that David Miller had given himself his Appalachian Trail name, I have decided that I will probably do the same. Better to pick you own name then to get an undesirable one on the trail. I have an idea for a name but I would like to get my reader's input. If you want to suggest a trail name, simply leave your suggestion either in the blog comments below this post, in a comment on Facebook, or as a reply on Twitter. I will tally up the suggestions and will post the best ones in a poll before we head out for our South American trip so people can vote for the best. No variations of [Name][y] Mc[Name][y]face will be accepted including Hiker McHikerface or Walky McWalkyface. For those who are wondering where this came from, read up on the saga of Boaty McBoatFace. So there you go. You have until the end of May to submit suggestions. I predict that I will get very few suggestions, if any. I rarely get any when I have asked for input in the past. I asked about my beard back in 2008 and got a handful. I asked for a suggestion for a Favicon design and gone no input whatsoever. I asked a simple trivia question and also got zero answers. But will not give up. Maybe this time will be the one. Book: David Miller's "AWOL On The Appalachian Trail"
It took me until mid-April to work my way through the stack of magazines I had on my night stand. This really wasn't because it was a 'yuge' stack but it was due to my mediocre commitment to read them that slowed it down. Now that I've caught up on my subscriptions it is time to start reading books again. I started with David Miller's "AWOL On The Appalachian Trail". You may have heard me mention David Miller's name before. It was his guide book that I used when I planned out my Appalachian Trail (AT) stages and I give him credit on my Appalachian Trail tab above. When his job wouldn't give him a leave of absence, Miller quit his job and began thru-hiking the AT. This book chronicles his five month trek across fourteen states from Georgia to Maine. The first thing I noticed as I read this book was that it sounded a lot like my posts. His writing style is a more polished form of my own. The second thing I noticed is that his experiences on the AT were exactly what I expected. His hike reminded me a lot of the Camino. The friendships that are formed. The injuries he suffered (an infected heel blister and a sprained ankle). The walking meditation that occurs during hours of walking. The AT seems to be just a much larger version of the Camino experience. I really liked this book not only because of how it was written but how it made me feel. I have to admit I haven't been very enthusiastic when it comes to the AT. I've been suffering of pre-adventure anxiety - something that I always encounter before a big adventure like Caminos one and two, RAGBRAI, and my Rocky Mountain Camping trip. As I read Miller's account I could feel my anxiety morph into anticipation. I am really looking forward to getting on the trail and doing this. One thing I learned, Miller gave himself his own trail name. This caught me by surprise as the tradition is to receive your trail name from your trail mates. Not wanting to get stuck with a lame name, he introduced himself as AWOL. This has me thinking .... and I will discuss what I'm thinking in another post in the near future. I give this book five stars on Goodreads because ... it was a fun read and it made me feel better about what I will be jumping into next year.